Serial EEPROMs (Electrically Erasable Programmable Read-Only Memory) are non-volatile memory devices. This means that the data is retained even if the chip is not being powered. These type of EEPROMs can be written more than 1 million times and behave like tiny hard drives which make them ideal for data and program storage. Enough of theory but first let me explain why I decided to develop such project. Around April 2013 one of the Arduinos I own, a Nano 3.0 to be more specific, had a faulty voltage regulator. This flaw put the 12V from the power supply directly into the 5V line causing a permanent damage to the uC (ATmega328P). Also, as I had attached to the circuit a 24C32 EEPROM, I needed to make sure if it was dead or not. So, I wrote a few lines of code which would help me confirm for any memory bank flaws on the 24C EEPROM series. However, even though serial EEPROMs can be written more than 1 million times, do not run it for too long. The software will run indefinitely until it finds a flaw. The circuit is extremely simple. You just need an Arduino and a 24C series EEPROM to test. Now compile it, open the Serial Monitor and let it run for a while. The first number represents the byte position which will be tested. The second number is the random value which will be written into that byte. If the read value (third number) equals the written value an “OK” message will pop. Else, a “NOK” message will be thrown and the program stops. As homework you can try to change this code into a more effective and simpler one. My idea is to write in each byte the following bits: 0b10101010. And on the next run write its invert: 0b01010101. 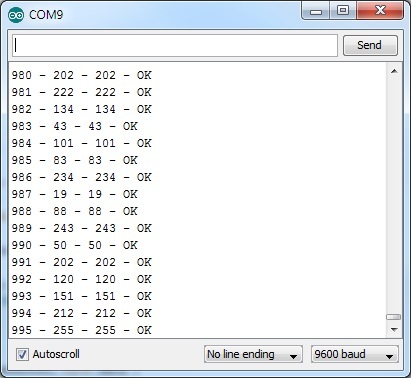 With a code like this you can check the entire EEPROM with only two write/read cycles.